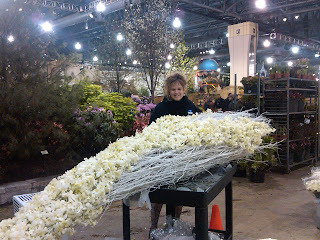 Home Uncategorized Philadelphia Flower Show, continued! Just wait until you see the finished concept that Shaffer Designs has in store for you! that are throughout this Polar Fantasy. Amy’s Orchids sent the most delightful orchids, which we had the extreme pleasure of attaching to the white twig armiatures. The effect is visually stunning. This particular one that I got to work on is 12′ long. Totally worth it and the visual impact is…wow…just WOW! All the product that Bill Schaffer procured (along with Kris Kratt, of course!) has been terrific. 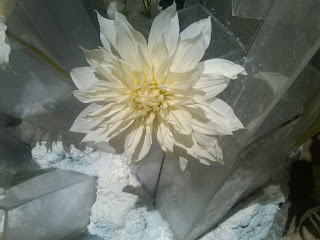 Check out these Japanese Dahlias that have just come available on the US market. This bloom is about 12″ across, totally fresh, completely inspiring. I can hardly wait to show you pictures of that show the scope and scale of this project. I wish you were all here in Philly with me to enjoy the fine folks at Shaffer Designs and their wonderful project, Polar Fantasy.